Consciousness: What is the Conscious Entity that I Perceive Myself to be? Science can, however imperfectly, measure and map the elements of the physical universe. It can thence determine the laws that govern their behaviours. This includes the human body, and to a much lesser extent, the human brain. Science can, albeit to an even lesser extent, examine the emotional behaviour of the human mind when it responds impulsively to controlled provocation. But the conscious "me" that can rightly say, "I think, therefore I exist", seems to be beyond the reach of scientific instrumentation and examination. Science simply can't get a handle on it. 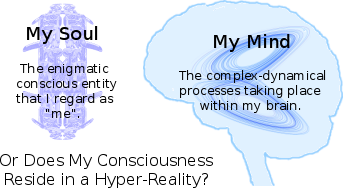 Is the real "me" an individual hyper-physical "spirit", looking at the material world through the portal of my physical brain and body? Are my brain and body simply layers of some kind of "communication interface" that give this "spirit" access to humanity's common universe of time and space? I am left with many fundamental questions that I feel compelled to ask but which science and philosophy cannot answer. For example, why am I here? What's it all about? 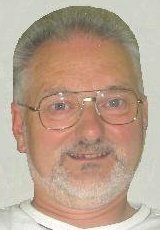 If my parents had never met, would the conscious entity that is "me" have been born into a body procreated by another couple, or would "I" never have existed? To address these questions, I must start with my most fundamental piece of knowledge. And that is the fact that, whatever this "conscious me" is, it is aware. But of what is it aware? It is the subject that is aware, but what is the object of its awareness? I am aware firstly of something that is not me. It is beyond me. It is outside of the conscious entity I think of as "me". It is what I think of as the outside world. Secondly, I am aware of myself. This is how I deduce that I exist. However, I am aware of myself only indirectly. It is only by being aware of the world outside that I deduce by consequence that there must be something separate experiencing this awareness. This begs the question: what is the dividing boundary between what I perceive to be the outside world and what I perceive to be the perceiver of that outside world? Where does "me" end and the outside world begin? Thinking superficially, I might presume that "me" ends at the surface of my body. So I would see my skin as the dividing surface between "me" and the outside world. Thinking more deeply, however, I notice that my body is something that "I" can look at objectively. I perceive it as something separate from my consciousness. It is also com­pletely dependent for its existence upon the outside world. To function, it needs air, water, food, clothing and shelter, which only Gaia can provide. This leads me to believe that my body must indeed be part of the outside world, an in­separable part of the Earth's biosphere. Since I perceive my body to be part of the physical outside world, the boundary between what I perceive to be "me" and what I perceive to be the "outside world" must be inside the envelope formed by my outer skin. If I were to lose my legs or my arms in an accident, they would be gone. But I would still be "me". If I were to lose control of all my limbs and all voluntary muscle movement through some kind of motor-neuron disease, I would be tremendously disadvantaged physically. But I speculate that I would still be just as much "me". I would still be just as much aware, therefore I would still just as much exist. But what about my brain, heart, lungs, liver, kidneys and other vital organs? Medical science has managed to perform transplants of all but one of these vital organs. It has also created apparatus that can perform, in part, the functions of all but one. In the future, these will, no doubt, continue to improve and should ultimately almost equal the performance of the corresponding natural organs. If I receive, by means of surgical transplant, somebody else's heart, am I still "me"? Or am I partly "me" and partly the person whose heart I received? I feel that I would be still completely "me". I think the same argument would hold for all the other vital organs. Except for my brain. Am "I" in My Brain? Suppose I have a terrible brain disease but that the rest of my body is supremely healthy and fit. Suppose somebody else has a body that is degenerating rapidly but whose brain is perfect. We are both going to die in a few weeks unless something is done. It is decided that the good brain of the other person should be transplanted into my cranium. The transplant is performed. The other person's body and my brain are thrown in the trash. My body and the other person's brain now constitute a perfectly functional human being. But who is it? Is it me? Or is it the other person? Or is it a bit of both of us? Intuition tells me that it is 100% the other person and that I am dead. This suggests that the bounding surface that separates the conscious entity I know as "me" from the "outside world" must be at, or within, the outer surface of my brain. As I look at my hands typing on the keyboard of my computer, I have the sense that they are some distance away from "me", although I have full control over them. My sense of where I am, relative to my hands, is in my head just behind my eyes. It is also the point from where I hear sounds. Nevertheless, I cannot pin-point "my" position exactly. I do not think that "I" am located at any precise point within my head. Rather, I sense that the conscious entity that is "me" is somehow distributed throughout my brain. I have the strong feeling that "I" am almost the width of my head and from just below the top of my head to just above the roof of my mouth. The whereabouts of the "conscious me" within my head is therefore somewhat fuzzy. On the other hand, I also sense that the network of 200,000 million interconnected neurons, arranged in their various topologies, that make up my brain isn't "me" either. It is just a vast biological computing device hosting representative models both of the "outer world" (which includes my body) and my inner thoughts (my personality, my character, my philosophy, my knowledge and my wisdom). Analogies are never perfect but I find it useful to think of my mind as the software of my brain. Within my mind, processes are born, live and die. I am given to understand that these processes are manifested as churning galaxies of activity within my brain. 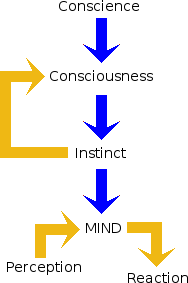 However, instead of each having its own space as the diagram on the right suggests, each process is somehow distributed throughout much of the brain. The more dominant of these processes appear as the involuntary thoughts that flit in and out of my conscious view like leaping monkeys. I must capture and examine each as it comes, otherwise it quickly falls away and is lost. There appears to be a mechanism within the physical brain that somehow filters out all but the most dominant thought of the moment to present to the conscious "me". A sufferer of hyperactive attention-deficit syndrome is very unfortunate. His poor consciousness is battered unceasingly by a cacophony of a myriad simult­aneous thoughts. 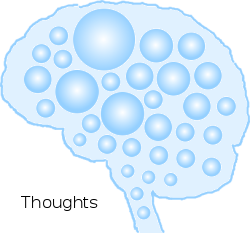 His brain simply does not contain the filtering necessary to select just one thought at a time so he can give it his undivided attention. These processes include neural models, which simulate events in the outside world. I am given to understand that, what I appear to be experiencing of the outside world is really coming from a neural model that is simulating it within my brain. Furthermore, the model itself is receiving most of its input from my memory, not from my senses. All that comes from my senses is a relatively small amount of data that supplies the prompts and cues needed to keep my model up to date and synchronized with what is taking place outside. My mind also contains a class of built-in programs that monitor the outputs from such models and construct "appropriate" responses automatically. These built-in programs are collectively referred to as my instinct. At times, I (the conscious "me") can "watch" my mind reacting automatically to an ext­ernal provocation. It acts out endless scen­arios that test the world's possible reactions to my reactions in vicious exchanges. Yet, as a conscious observer of such scenarios, I remain quite detached from my mind, my brain, my body and the world outside. Sometimes, I see my mind being driven by my natural basic instinct. It reacts with blind emotion to an external provocation and drives my brain and body to expedite its desired physical response. On other occasions, I see my mind responding under the control of an acquired mental skill or physical training. It automatically avoids a dangerous encounter in fast traffic or sometimes materializes a finished Java method as if without conscious thought. It can automatically reason out calculated responses, taking into account both tactical and strategic considerations. Yet "I" - the conscious observer - do not actively participate. But I could participate if I wished. I have the capability of exercising conscious volition to halt the automatic reactions unleashed by my mind, and of taking over deliberate control of the situation. I could say "No, I am not going to react in this emotionally-determined way. I shall respond in the way I consciously choose according to the advice of my conscience with regard to the situation." I am thus forced to conclude that "I" am not my mind. I am something separate. Am "I" Beyond My Mind? I think, therefore, that this enigmatic conscious entity called "me" must be non-physical, even though it interfaces, in a distributed way, with my physical brain and my mind (which I think of as the software data, methods and processes taking place within my brain). Enigmatic is the right description. For, ironically, I find that I can know far less about "me" than I can know about the outer world into which I look. My conscious "self" is not something I can examine in the same way that I can examine my mind, my brain, my body, the world outside my body and indeed the vast universe beyond. This leads me to conclude that my conscious self must be an intangible entity that exists in some kind of hyper-reality that is beyond what I perceive to be physical. It must therefore be composed of some kind of hyper-material that is not what I would perceive to be physical. My term hyper-reality here does not refer to a realm that is separate from the physical universe. It refers to the part of the one and only universe that is, and will forever be, fundamentally beyond the capability of the human mind and senses to examine. It must also be forever beyond the reach of any instrumentation that could be invented to extend the range, sensitivity and diversity of the human senses. I see the universe as a single continuum of which physical reality is a sub-realm. Hyper-reality thus refers to that part of all reality that human senses can never perceive. Notwithstanding, my consciousness needs my physical brain as an interface between its realm of existence and what I perceive to be the physical realm. It is only through this that my consciousness is able to exert itself within the physical realm that accommodates my mind, my brain, my body, the world outside my body and the universe beyond. Without this physical interface, I have a strong feeling that my consciousness would be completely isolated. Evidence for this idea comes from considering sleep. What I perceive to be "me" goes to sleep and wakes up again always in the same physical body. This lends weight to the idea that what I per­ceive as "me" is exclusively conn­ected to my physical brain, if not completely embedded within it. And it is my physical brain that exclus­ively determines when I am or am not conscious. It wakes "me" up and puts "me" to sleep again. The "wake-up" signal comes from the real world outside, via my physical body. My bodily senses pass the signal to my brain and my brain wakes "me" up. And I am always there appar­ently awaiting such a wake-up call. Sometimes, this wake-up call comes prematurely or spuriously. It could be triggered by a relatively weak sound, flash or smell emanating from the real world. This is strong enough to reconnect the conscious observer but not strong enough to wake the brain physically. In this case, it awakes "me" while my brain is still reorganizing its memories. "I" thus become "conscious" within a dream. Dreams are strange things. I can remember some clearly. Others I instantly forget upon waking. In a dream, I am not necessarily bound by the laws of physics. I can fly. I can shrink to explore an atom and survive a journey into a black hole. I find myself familiar with people I don't know. Dreams do not bear much relation to the real waking world. They seem to be the collateral effect, upon the consciousness, of the brain sorting out and reorganizing recent waking experiences and relating them with past memories. Dreams seem to be, in some way, analogous to the defragmenting of a computer's hard drive. The process goes on unseen by the user. 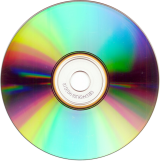 However, if the user were to display on his screen the blocks of data being moved around the disk, all kinds of disconnected bits of information would flash by. What he saw would not make any cogent sense. So, when my brain is reorganizing its connections during the night, the "conscious observer" may "return" prematurely from wherever he "goes", only to catch a glimpse of this reorganizing process. Ideally, the "conscious observer" should not be disturbed until the brain awakes and connects again, by way of the body, to the real outside world. I cannot conceive that dreams could be harbingic messages from beyond tangible reality. So where am "I" when I'm asleep? What happens to the "conscious me" when my brain is in "sleep" mode? Perhaps my consciousness is just one of many possible modes in which the complex dynamical process, running within the neural net­works of my brain, can operate. 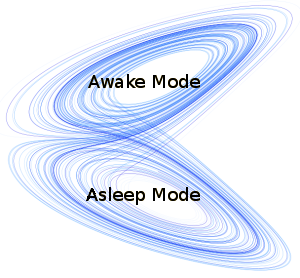 When "I" awake, perhaps it's merely this same complex dynamical process flipping onto a different wing of its strange attractor (awake mode). When "I" fall asleep again, the process simply flips back to follow its dormant wing (sleep mode). If so, the "me", that I perceive myself to be, must be no more than a part of the complex dynamical process taking place within my brain. I am given to understand that a human being spends a third of its life asleep. This means that the conscious "me" is only two-thirds the age of my physical body. At the age of 66, therefore, I have only been conscious for 44 years. So, what is sleep? Is it merely the absence of input for the "conscious entity"? Or has the "conscious entity" gone somewhere else within the realm of hyper-reality from where it can reconnect to the physical brain when it starts to dream or wake? Or does the "conscious entity" cease to exist during sleep? It seems that "I" am alive during each day, die each night, and am resurrected each morning to carry on from where "I" left off when "I" died the previous night. Thus, my consciousness is like a child's TV console game, whose state can be saved on a memory cartridge while the console is switched off. Its player can thus resume, at a later time, at the stage in the game that existed before the console was switched off. It seems that the real "me" is something that exists while it has communication with the outside physical universe, but ceases to exist when the communication link to the outside world is switched off by the physical brain when it gets tired and goes to sleep. While "I" sleep, my brain and my body continue their journeys through time. My brain continues working. My breathing and digestion processes continue. But "I" do not. For my conscious self, the long night passes as if in an instant. On occasions when I have been forced to stay awake all night, such as when each of my children was new-born or when I was on military piquet duty, I experienced just how long a night really is. Yet the time I spend asleep on a normal night seems to pass in an instant. My brain is still operating, but "I" am not there. So is unconsciousness any different whether my physical brain is asleep, or dead? While my body and brain sleep, time for "me" does not exist. "I" do not exist. It is as if "I" were dead. When "I" awake, my body has, albeit imperceptibly, aged a little. But "I" have not. It is as if my conscious self dies each night and is resurrected back to life the next morning. This suggests that after death must be no different from being asleep, which, in turn, must be no different from not having been born yet. The enigmatic entity I call "me" thus appears to depend entirely on my physical brain for its conscious existence. 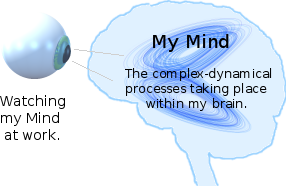 This suggests to me that my consciousness is nothing more than a part of the complex dynamical process taking place within my brain. If so, death must be the complete dissolution of being with no prospect of future existence. Life must be entirely transitory, marked only by its 5 phases of birth, growth, maturity, senility and death. The above Materialist View allows only one sense in which my existence can continue after my death. I continue only as the knowledge and teaching I have imparted to my children and others, plus the physical and intellectual works I leave behind when I die. Almost all aspects of life, the universe and society can be explained within the bounds of this paradigm. There is, however, a strange twist to the notion that the consciousness is completely dependent on the physical brain for its existence. I frequently have a burning idea I am desperate to commit to writing. Unfortunately, this often occurs when my mind is simply too tired to function. So I cannot write. I have no option but to rest or sleep. This, at times, causes me great frustration. I surmise that if my consciousness were solely a function of my brain, I could not suffer this frustration. My consciousness too would be tired along with my mind. But the conscious "me" is raring to go. It is my mind that simply won't take it. So they must be separate entities. It seems, therefore, that my mind (the software that is running within the hardware of my brain) is simply a tool that my conscious self needs to use in order to gain access to the physical universe. If my brain (the computer) gets tired, the software (my mind) can't operate efficiently. Consequently, the conscious entity that is the real "me" starts to lose its connection to the physical world. When sleep arrives, the connection breaks completely. This leads me to suppose that perhaps our consciousnesses are all self-existent entities. But, because of the very nature of things, their existences are completely isolated from each other. The only way they can become aware of each other is through the physical universe. Their access portals to the physical universe are our physical minds running within our physical brains operating our physical bodies. Thus the universe is simply a medium that facilitates communication between otherwise isolated conscious entities. This enigma of tiredness gives impetus to my inner compulsion to ask the following searching questions. After the death of my physical brain, will my consciousness cease to exist, or will it merely be asleep? Could it be awakened into a new physical brain at a later time? What I call the Resurrectionist View, which some people conclude from the Biblical texts, goes as follows. At the end of this life, my body dies and decays. My consciousness ceases completely. My personal character and memory are preserved in an inactive state. An indefinite period of time passes. My body is resur­rected, that is, a defect-free exact replica is made. My original character and memory are 'downloaded' into my new brain. My mind reactivates. "I" reawaken, as if from a night's sleep, into a new and better world of the distant future. I live a new life for 100 years. At the end of this new life, I am either deleted completely, or my character and memories are copied across to an indestructible body made of some hyper-physical material (spirit) within which I continue my conscious existence forever. This idea necessitates that all my personal character and memories be indelibly preserved on some kind of higher-reality medium capable of storing information. I imagine this medium as the "spiritual" equivalent of a diskette, tape, CD, hard drive or flash memory. It is outside or beyond what I perceive as physical reality, although it is still part of the continuum of all reality. The information imprinted on it is what constitutes the real "me". The information recorded within this medium is eternal and indestructible. It cannot fail, fade or deteriorate. The consequence of this is that, if and when my physical body wears out and dies or is otherwise destroyed or rendered totally dysfunctional, the hyper-medium recording is still there. The real "me" is not conscious just as when I slept each night during my physical lifetime. Notwithstanding, all the information necessary to reactivate the "conscious me" through another body is still there perfectly and indestructibly preserved as a static recording. I feel certain that all my memories and personal character are contained within the physical neural networks of my brain while I am alive. But is there a medium, beyond my brain but still within the bounds of known reality, that could bear a detailed recording of my entire life, memories and personal character? One idea is as follows. For this idea, I need to make 2 initial assumptions. Firstly, the universe - by definition - is connected space. Consequently, the effect of any event occurring at any point in space and time must eventually be felt in some way at every other such point in the universe. To achieve this, every event, no matter how microscopic, must emit a wave of some kind that travels outwards from the event at or less than the speed of light. 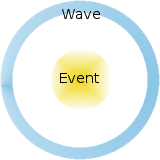 In fact, the wave is the event. Once the wave has left, nothing of the event remains at its point of origin. Secondly, each indivisible element of thought occurring within my brain must be considered to be such an event. The information-content of each indivisible element of my thoughts, as they occur within my brain, will then travel outwards from me at the speed of light along my future event-horizon. Thus, each thought that I have comprises a myriad fundamental events. Each of these events can be imagined as a change-of-state in some kind of finite-state machine within my brain. Perhaps a neuron is such a machine, whose various finite states are themselves complex-dynamical processes. Or perhaps these little mach­ines are the microtubules that make up the connecting bridges between neigh­bouring neurons. Whichever the case, when such a machine changes state, it emits a wave. Whether this wave be electromagnetic or some other kind of wave I do not know. Nevertheless, modulated upon this wave is the essence of the thought that triggered the change of state in the elemental finite-state machine that generated it. The information-content of my thought is thus now in the wave travelling outwards from my head in an ever-expanding sphere at the speed of light. After 3 nano­seconds, the wave has reached the person sitting next to me. After 28 milliseconds, it is passing through Europe. After 8 minutes, it will have reached the sun. In 2½ million years, it will pass through the Galaxy of Andromeda. 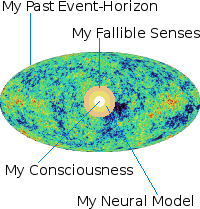 In about 13 billion years, it will have reached where the edge of the known universe was when it started its journey. While I'm alive, my future event-horizon is a sphere that's expanding at the speed of light. My consciousness is a fuzzy singularity at its very centre. When I die, my consciousness ceases. 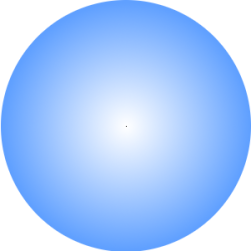 My future event-horizon then becomes a spherical shell. If, 1000 years into the future, technology emerges that can capture this kind of inform­ation, it would be unable to capture mine. The waves produced by events in my brain would be contained in a spherical shell 1000 light years radius and 90 light years thick (assuming I live for 90 years). It would be as if all the information about me were stored in an open-ended version of the delay-line memory used in early computers. It is an irony of the structure of space-time that wave-borne information generated during my life-time is fundamentally inaccessible to people in my future here on Planet Earth. Similarly, wave-borne information generated by the brains of people in the past is fundamentally inaccessible in the here and now. Hence, it is impossible for me or anybody else to be resurrected in this way at some future time on Planet Earth. 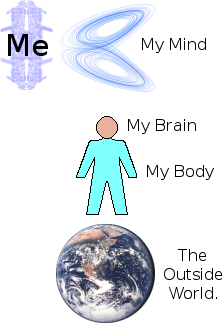 Nevertheless, in 2½ million years from now, if there should then exist a sentient being on a planet somewhere within the Andromeda Galaxy, he would be able to capture the information-content of these waves as they arrive along his past event-horizon. This captured information would present to him the unfolding history of my thought processes from birth to death. The entirety, of what and who I was, would thus be revealed. If his technology were sufficient, perhaps this alien being could reconstruct my body, complete with a new brain containing my personality, character and memories, and breath again into me the breath of life. Far-fetched? Yes, but nonetheless conceivable within the bounds of the laws of physics. If the necessary technology existed now, the information waves emanating from my brain could be captured and stored locally. This information would then be available for resurrecting me at a later time. But the technology does not exist now. Nor is it likely to do so for an extremely long time, if ever. Consequently, nobody alive today or at any time in the past can ever be resurrected by this method. Nevertheless, somewhere within the physical universe, all the information per­taining to my life, memories, personality and character will forever exist within this expanding shell of waves. Unfortunately, this scenario has a sting in its tail. The information will not last absolutely forever. It will become gradually eroded or degraded by a phenomenon known as dispersion. A familiar example of the degradation of wave-borne information by dispersion is the speaking-tube used many decades ago on ships to allow people on the bridge to communicate with people in the engine room. Over the distances involved on a ship, the voice of the speaker remains intelligible. However, were the speaking-tube to be lengthened to span the breadth of a city, the speaker's voice would be nothing but an unintelligible echo to anyone listening at the other end. 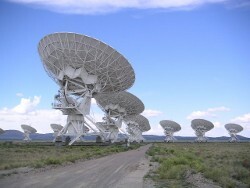 Interstellar space is not completely empty. It is not a perfect vacuum. It contains atoms and dust particles, stars and planets. These act like the walls of the speaking-tube. Through reflection and gravitation, they will slowly but surely distort the waves that carry the recording of my lifetime's thoughts. Eventually, these waves will lose more and more of their fidelity and crispness until the fine details of my original thoughts are no longer recoverable from them. Thus, sadly, like an old soldier, I will eventually just fade away. My only possible last saving grace would be if, 2½ million years hence, inhabitants of the And­romeda galaxy were to capture my event-waves, before dispersion had time to make them unin­telligible. They could then reconstruct me from the information within them. Alternatively, they could simply resharpen the partially-dispersed waves and retransmit them in pristine form so that an even more distant civilization could cap­ture them later and reconstruct me from them. But would what the Andromedan engineer reconstructed really be "me"? Could it possibly be "me"? Let us assume that he is able to use the ultimate technology that is possible within the bounds of the laws of physics. Could he then reconstruct a body containing a brain? It need not necessarily be made of hydrocarbon-based "flesh and blood". It could be made of whatever materials are most convenient to him, provided the resulting body and brain are functionally equivalent to the body and brain I currently inhabit. Could he then, without having to violate the laws of physics, upload into that brain my memories, personality and character that he captured from the passing waves? Could he then kick-start the whole configuration into life so that it became a living being? Let us suppose he could do all this. Let us suppose he has done it. Question: would that reconstructed being contain the conscious entity that I now perceive myself to be? Or would it merely be a zombie with my character, personality and memories but with no conscious "me" inside? I cannot answer this question. Nevertheless, from it I can make an interesting deduction. Suppose it really is "me"! 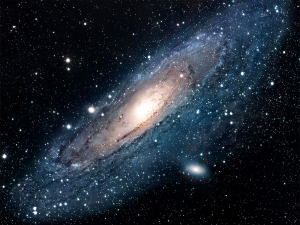 2½ million years hence, I wake up as if from a night's sleep, on a planet orbiting a star in the Andromeda Galaxy. This being the case, the conscious entity that I perceive myself to be must be entirely physical. It must be part of the material universe. It was borne intact for 2½ million years within the complex train of waves that radiated from my brain during my lifetime here on Earth. Suppose on the other hand, the only thing the Andromedan engineer can construct, within the bounds of the laws of physics, is a zombie that appears to have my personality, character and memories. However complex and sophisticated it may be technologically, it is merely a machine. The conscious entity that I perceive myself to be is not inside it looking out into this Andromedan world. This being the case, the conscious entity that I perceive myself to be must necessarily be something whose existence and being is outside the domain of what we perceive of as material reality. The physical train of waves could not contain it. They could not, therefore, convey it to Andromeda. It was left behind in another dimension. My own intuition is that all the Andromedan engineer could reconstruct from the information borne in the spherical shell of waves arriving at his planet would be a zombie. It would appear to exhibit my personality and character. It would recall my memories. Perhaps it could even pass the Turing Test to convince people that it really was me. But intuitively, I don't think that "I" would be looking out through its eyes. My intuition is, therefore, that the self-conscious entity that I perceive myself to be, although dependent upon my physical brain in order to think and communi­cate, has its existence and being beyond those dimensions of the universe that can be humanly perceived. If the conscious "me" does indeed have its being in hidden dimensions, this raises another question. Do things, including conscious entities, that are formed from the fabric of this higher reality have permanence of form? In other words, are they eternal? Or, once the physical brain dies, does the conscious entity evaporate and thereby cease to exist? If conscious entities are permanent and eternal, then in principle, mine could be reconnected via its fio de prata to the zombie built by the Andromedan engineer. The zombie would then become "me". I would have a new span of life. If, on the other hand, the conscious entity did evaporate, then its evaporation is an event. It is a complex event, but nonetheless an event. Consequently, it will radiate and its essence will be propagated as waves within the fabric of the hyper-reality it inhabits. Then perhaps an Andromedan angel could capture this hyper-real radi­ation and reassemble my soul. He could then install it within the zombie that the Andromedan engineer had built. So, this way too, the zombie would become "me". I would live again. There is, however, an unresolvable piece of collateral awkwardness in this idea. If the whole, of who and what I am, be contained in an ever-expanding spherical wave, then, with appropriate physical technology, many alien engineers in many far-flung parts of the universe could reconstruct me. Which one of the many resulting "zombies" would the real "me" inhabit? Would it be all of them? If so, then "I", as a conscious being, would become many. But these all must, of necessity, be separate conscious entities. All but one could not therefore possibly be "me". I conclude, therefore, that the conscious entity, that is "me", must be indivisible, and that consequently, all self-aware consciousnesses must be indivisible entities. They must literally be: individuals. A conscious entity cannot be divided, nor indeed, even replicated. The Greek word "atomos", from which the word "atom" is derived, means "indivisible". Each individual is thus an atom of consciousness. Although it be indivisible, I perceive my conscious self to have internal structure. This is evinced by my ability to reason out deductions from my observations and experiences of the outside world. This process of reasoning something out involves argument and counter argument. This requires the construction of two differing points of view, from which my observations and experiences of the outside world must be considered. To facilitate this, my consciousness must be able to accommodate at least two persons: one to propose the argument and another to counter it. 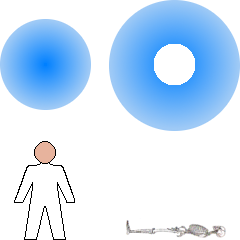 The fact, that the points of view held respectively by these two virtual persons are different, creates between them what may be described as a semantic force-field. Suppose "I" - the real "me" - am in favour of the argument. "I" need the second person - another "me" - as an antagonist against which to exercise the real "me's" argument. "I" then need a third "me" to arbitrate the argument, because "I" have a genuine desire to prove or disprove "my" argument fairly one way or the other. Thinking atomically, I imagine these three virtual "me's" as three quarks of consciousness. During the reasoning process, the real "me" thus flits, like a gluon, from one quark to the next in a cyclic manner. In other words "I" mentally place myself, in turn, into the shoes (so to speak) of each of these 3 people. Notwithstanding, these 3 people in my head are not multiple "me's". There is only ever one "me". During the process of argument, the one and only "me" simply transfers its source of experience from my normal mental input to the other characters that I have deliberately and consci­ously constructed within my mind. I thus reject any notion that the other two characters in my play be components of a multiple self or separate ripples upon the surface of a universal pool of consciousness. I could take the cyclic transfer of my conscious self between different characters in my mind to various levels of extremism as follows. 1) I could take on a character role, as does an actor, to play the part of the fictitious character I have built. 2) I could become so fanatical in this endeavour that I find myself believing that I am that character. This is called full character immersion. 3) That character could become so dominant that I come to see it as a real external entity that has taken over my being. I could even become cyclically "possessed" by a variety of "entities" or characters that I have constructed from both real and false memories. My own intuition, from this space-time wave memory idea, is that a conscious entity maintains its form and functionality after the physical brain dies. It does not emit (and thereby become) an expanding spherical wave. But, being deprived of a brain and body through which to experience and communicate with the physical universe, it remains in a state of sleep until somebody reconnects it to a means of accessing the connected universe and hence, other consciousnesses. Notwithstanding all this, if there is to be life after death, then human memory and personal character must be preserved by some means. Indeed, there are other ideas about life after death for which the "space-time wave memory" simply can't work. One of these ideas is what I call the Generic Christian View. The common belief, as I understand it to be, goes as follows. At the end of this life, my body dies and decays. My soul (the conscious "me") comes out of my dead brain. It is then transported immediately to one of two hyper-physical realms, depending on whether my soul be lost or saved. If it be lost, it goes to a realm of eternal torment called Hell. If it be saved, it goes to a realm of eternal joy called Heaven. In this view, the memories and react­ions that make up my personal char­acter are contained within my brain. Herein they develop throughout my physical life. My consciousness, on the other hand, is not physical. Al­though co-located with my brain, it exists within a hyper-physical realm, within which it is completely isolated. It has access to the rest of the uni­verse only via my physical brain. Consequently, "I" am aware only of those aspects of universal reality that can be perceived through my human senses. At death, my brain ceases to function but my consciousness continues. It is instantly transferred, along with all my memories and personal character, into some kind of hyper-physical (or spiritual) body. Perhaps the transferring process takes place continuously throughout physical life rather than instantly at death. In this view, the hyper-physical part of my being, namely my consciousness, memories, personality and character, are collectively referred to as my soul. Another view involving hyper-physical consciousness is what I call the Migrationist View. This goes as follows. At the end of my life, my body dies and decays. My soul (the conscious "me") is preserved in an inactive state within a hyper-physical recording medium. It then waits in this non-active state until an appropriate new host becomes available. My soul then migrates to become the consciousness of the new host - a new-born human, or possibly an animal. That new person or animal then continues as "me". This process repeats indefinitely. This belief is said to be evinced by the fact that some people can remember past lives. I can remember nothing about any previous conscious existence I may or may not have had. Perhaps this is because I have not yet had a past life. This must be my first. From what I can gather, accounts of memories of past lives in others are, to say the least, very rare. And they all seem to be exceedingly nebulous and frag­mentary. 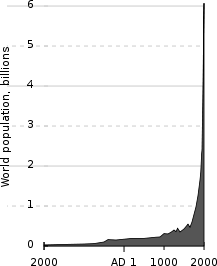 Until recently, the human population of this planet was increasing geometrically. Over the past century or so, population growth has been literally explo­sive. 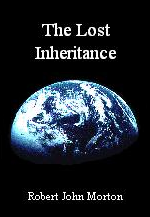 Only a few generations ago, therefore, com­paratively few human beings inhabited this planet. Consequently, relatively few of the people alive today could possibly have had a past life. There were simply not enough people around in previous generations for everybody alive today to have had a past life. Past lives, therefore, could only be had by a select few. Why should this few be thus privi­leged? If previous lives are so rare, then, in all probability, so are future lives. Of course, everybody alive today could have had a past life, provided those past lives were lived over a large enough span of the past. Suppose that we divide the black area under the above graph into two equal areas. The people who lived in the long period represented by the left-most horizontal area are reincarnated during the much shorter period represented by the equal right-most vertical area. In other words, everybody who lived from 2000 BC to about 1600 AD are reincarnated during the 20th Century. That would work, but it would mean that most people would have had to wait an awfully long time for their second innings. Yet another view is what I call the Transitional View. This goes as follows. At the end of my life, my body dies and decays. My soul (the conscious "me") comes out of my dead brain. It then takes on a more advanced state of being and "I" continue life on a higher plane (whatever that may mean). And there are yet other views. Current scientific thought asserts that in about 1,000 million years from now, the sun will have become so hot that it will utterly desiccate the Earth and destroy its biosphere and every living thing within it. Gaia will be no more. It will be as if humanity with all its heritage of culture, philosophy, art, music, literature, and science had never existed. About 4,000 million years later, the sun will expand into a red giant and swallow up the inner planets, leaving the outer ones to wander the cold reaches of interstellar space. Eventually, the entire universe will descend into a thermal death. So why do I hunger for knowledge about science, art, music, literature and culture? What practical relevance can this have to my immediate survival? As my personal path of life has irrefutably proved, it has no economic relevance whatsoever. Why should I want to know about the universe beyond my own planet? What drives me to strive for well-being and fulfilment? What fires my determination to seek a more benign society that will dispel the present pandemic of poverty, disparity and social injustice? Indeed, why should I care whether or not I survive? Why am I curious and concerned about life after death? Why should I be interested in continuing my conscious existence? Could my drive to survive, my need to know and my hunger for eternal life be imperatives that were embedded within my brain by inherited pre-programming? If so, then how and why? If it's all going to end a 1,000 million years from now, it's an awful waste of time and space. If I were not aware of my own existence, the fact that the universe is going to end would not matter. It would be irrelevant. But I am aware of my own existence. My frustration is that I cannot turn round and look directly at this mysterious entity of which I am aware. Whichever way I look, within the dimensions of space and time, is wrong. I can't seem to get it within my sights. I can't get a visual lock on it. I (my conscious self) can look outwards in all directions into society, the world and the universe beyond. But to be able to see my conscious self, I would need to look inwards beyond the point in time and space from which the laws of physics constrain me to observe. I would need to be able to angle my view in such a way as to be able to look inside the intangible singularity at the very centre of my personal event horizon. But I can't. It is geometrically impossible. Suppose I could look inwards beyond the singularity of my consciousness, what should I see? Perhaps I would find myself looking outwards into my own future event horizon. This would enable me to see the future. But I can't see into my future event horizon. This, according to all known laws of physics, is an impossibility. Notwithstanding, others can see me in my future event horizon because it overlaps their past event horizons. I can look outwards from me, but only others can look inwards at me. Yet others cannot look into my consciousness. They can never look inwards through the singularity at the centre and outwards again into my own past event horizon. If they could, they would be literally looking at the world through my eyes. They would be able to experience the world through my consciousness. Fortunately, others can never see the world directly through my eyes. They can never experience the world through my thoughts. The very structure of space-time ensures that my thoughts and my past event horizon are strictly my own exclusive private property. It would thus appear that I am the intangible singularity in between my past and future event horizons. But I am in neither. I am outside of both my past and future event-horizons. If my conscious self exists within a "space-time", then it must be a kind of "space-time" that is outside known physical dimensions. Perhaps it exists within localized closed dimensions of the kind that are postulated by String Theory. Or perhaps it exists within open dimensions to which it, itself, cannot be consciously aware. Whatever the case, it is consequently impossible for either myself or others to know "me" directly. How then can I be aware of "me"? What gives me awareness of my own existence? I cannot see my own face. In fact, I cannot even see my own head. I do not know what my face or head look like directly. I can see my face reflected in a mirror or a smooth water surface. 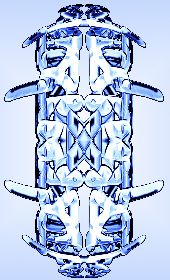 However, this has the left and right sides reversed. Besides, I can only ever look at it from one angle, namely, directly in front. I remember that, as a young child, I was intrigued and rather surprised that I looked the way I appeared in a mirror. But I soon got used to it. Throughout human history, there must have been many humans who never had sight of their reflections, and so would have no clue as to what they looked like to others. During secondary school I remember experimenting with multiple mirrors as part of my physics course. By adjusting the angles between the mirrors, I could view my head from different angles. How strange my head appeared to me. I had had no idea it was that shape. My previously presumed image of myself was quite different. I felt rather odd. "So that's how others see me," I pondered. It was quite ego-shattering. Nevertheless, even this was not a direct view. It was not exactly as others saw me. Practically all photographs that people have taken of me are from one angle only, namely, face-on. This is like a mirror image without the left and right sides reversed. Such a photograph is invariably posed. It does not provide a spontaneous view of me the way others see me in day to day life. I have occasionally caught a glimpse of myself on a closed-circuit television monitor. This gives a more realistic view of me the way that I speculate that others see me. I have also seen myself on video. These are still only relatively low-definition two-dimensional versions of the real view. Nevertheless, they show me that, from the points of view of others, I do not look or move the way I would have expected. If my preconception of my own physical appearance can be so wrong, what about my preconception of "me". How do others see "me"? I conjecture that "me", as viewed from the points of view of others, would seem to "me" even more strange than does my physical appearance. No "video system" exists that can view my conscious self through the eyes of another consciousness. So how can I ever know how the self-aware enigmatic conscious entity I call "me" appears from the points of view of others? I am unable to see directly the self-aware entity that is "me". I cannot see its form or shape. To me, it is a faceless, formless mystic entity. In my imagination, I can only ever get as far as using some kind of imaginary totem to represent it. So how can I be aware of its existence? Through what means does it convey its presence to me? The only way I can think of is that I must somehow be able to see its reflection within my own (past) social event hori­zon. It must somehow create a reflection of my conscious­ness the way a mirror reflects my physical image. The events that populate my social event horizon are the lives of 7,000 million other human beings that inhabit this planet. I am able to perceive my own consciousness only as it is reflected back at me by this myriad of tiny flickering human "mirrors" of thought and emotion. I am thus aware of my conscious existence solely through the complex reactions that other members of society have to my presence. People react to my physical appearance. They react to my gender. They react to my age. They react to my social status. Above all, they react to my personality and my character. My personality is the way, as a conscious entity, I appear and respond to the presence of others. Some aspects of my personality may be genetically determined. Other aspects may be determined by my formative family environment. However, I believe that my personality is, for the most part, a reflection of the Zeitgeist. In other words, it is a reflection, within my own consciousness, of the spirit of the era. It is a reflection of contemporary culture. It is a reflection of the prevailing language and expression. It is a reflection of the popular art and music. It is a reflection of the science and technology. It is a reflection of the essence of the society in which I live. However, it is a very specific reflection. It is a reflection of all these things as seen and experienced by "me" from my unique location in time, space and the social order. Human society is a complex-dynamical network of 7,000 million conscious entities. As such, it is a generator of astronomical variety. Consequently, it appears very different from different places at different times. Each of its 7,000 million members must observe it from his own unique position in time, space and the social order. Each member's view of it must therefore be unique. Its reflection within the consciousness of each of us must therefore also be unique. That is why each of us has a uniquely identifiable personality. Higher animals also seem to have individual personality. In their case it is more rudimentary because their "societies" are less complex and interactive. My personality thus gives "me" a unique identity, which is, at least for the most part, a reflection of society within the mirror of my consciousness. However, I am trying to find what is perhaps the opposite reflection. I am trying to catch, within the mirror of the Zeitgeist, a glimpse of my own consciousness. I want to see what I am. To do this, I must first consider another aspect to my conscious existence. An aspect that I refer to as my character. I see my character as the motive behind the way I act in response to opportunities that spontaneously appear and to situations created by others. It is what determines how I react to what I perceive, experience and suffer. At the most fundamental level, the motive behind any action I take is that of survival and self-preservation. This default motive is part of the natural instinct that is pre-installed by hereditary programming built into the cells of my body. It is designed to protect myself and my extended self (my family, my community, my nation, my species and so on). This instinctive motive is essentially ego-centric, confrontational and manipulative. It is not conducive to the building of benign relationships. I (my conscious self) can observe my mind formulating and executing reactions to experiences according to the dictates of my natural instinct. However, by taking conscious thought, I (my conscious self) have the power of volition to intervene and alter or augment the motive dictated by my natural instinct. One way in which I can alter the motive driving my reactions to events is to accentuate or diminish the various dictates of my natural instinct. For example, I can consciously make myself more or less selfish than I naturally would be. On the other hand, I can alter my natural reactions according to the dictates of a more advanced source of motivation, namely my conscience. By so doing, I can consciously modify the programming of my instinct to make it more relationship-oriented. Every time I make a conscious intervention to accentuate the dictates of my natural instinct, I create or reinforce a more austere behaviour than that with which nature originally equipped me. Every time I make a conscious intervention to elevate the dictates of my natural instinct according to the advice of my conscience, I create a more egalitarian behaviour than that with which nature originally equipped me. My instinct thus contains what may be thought of as my moral character. If I habitually accentuate the dictates of my natural instinct, I develop a more egoistic character. I become more and more confrontational and adversarial. If I habitually make the conscious effort to act according to the advice of my moral conscience, I develop an egalitarian character. I become more and more able to relate with others. My moral consciousness gives me the ability to abstract symbolic models of my social universe, render moral judgements about it and communicate these to other human beings through symbolic language. Moral consciousness - or conscience - not only gives me a sense of what human society is, but also a conviction as to what human society ought to be. As my personality gives me a unique identity that I can perceive through the reactions of others, so too my character gives me a uniquely mode of behaviour that I can perceive through my relationships with others. Thus, for me, my consciousness seems to be an intangible singularity that joins my past and future event-horizons. It stands in my imagination like a gleaming sentinel in a narrow doorway. It faces my past with its back to my future. From its exposure to humanity, it forms within itself a unique personality as the film in a camera forms upon itself the image of a scene. It contains a default character (or inherent mode of behaviour) which is pre-programmed into it by nature to protect and preserve it. It also possesses faculties of moral conscience and conscious volition. These give it the power to take control of the mind it inhabits. With these it can modify its inherent behaviour. It can choose how it will behave. It can accentuate its self protection far beyond necessity to the point of harming others. Or it can gradually construct within itself an inherent mode of behaviour that is constructive yet universally benign. It can thereby become a conscious being that is able to form egalitarian relationships with other like-minded conscious beings. Frustratingly, this fleeting glimpse of what I see myself to be is nothing more than a faint reflection in the mirror of the society in which I live, namely, the people with whom I interact. As a result, my consciousness (the real "me") is viewable directly neither by other members of society nor by "me" myself. It can only ever be sensed indirectly in terms of society's response to its presence. But how true a picture does this faint reflection provide of the form and nature of my conscious self? Unfortunately, the picture it provides is not very accurate at all. It is fraught with insurmountable distortions and errors. For "me" to be able to know and understand precisely what "I am", my brain would have to construct, within itself, a complete neural simulation of "me". This would have to include neural sub-models of my outside world, my body, my brain, my mind and, above all, that intangible conscious entity I know of as "me". In other words, my brain would have to construct a neural model of my entire past event horizon, including the fuzzy singularity at its very centre. My brain, as complex as it is, simply does not have the capacity to accommodate such a model. Besides, nothing can simulate a universe that includes itself. In attempting to do so, it would encounter the problem of infinite regression. It would also have to simulate, within a physical medium, what appears to be a hyper-physical entity. And this has to be, by definition, physically impossible. 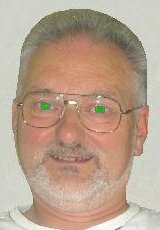 Furthermore, my conscious self has access to the universe only via my mind (the software of my brain) which receives all its inputs via my 5 limited human senses from a single fuzzy point in time and space. My perception of the outside world is therefore, of necessity, extremely fallible. Consequently, my brain's neural model of the outside world can supply my consciousness with nothing more than a crude and limited view of reality. Since my physical human senses can in no way sense anything beyond the physical realm, they can sense nothing of the conscious entity that is the heart of my being. Consequently, my consciousness can never be part of the crude and limited model of reality that my mind constructs within the neural networks of my brain. This is a fundamental barrier to my ever gaining a clear and direct vision of myself. Thus my consciousness - the fuzzy singularity at the very centre of my past event horizon - does not have a clear and unhindered view of the outside world. It is encased within two concentric shells that impede, att­enuate and distort its view. The inner shell is my brain's crude neural model of my past event horizon built from the somewhat erroneous information supp­lied to it by my fallible human senses (the outer shell). If I could look inwards, beyond the singularity, I would behold another concentric universe. This is my future event-horizon, which the laws of physics decree that I can never perceive. Only others can see my future when it becomes their past. My physical brain has very limited capacity. This limits the detail with which it can model its outside world. My 5 physical senses are not perfect conveyors of information about the outside world. My perception of it is therefore fallible. This, however, does not necessarily imply that my consciousness must also be imperfect. Given perfect sensory inputs to a perfect simulation, my consciousness could be perfectly capable of perfect perception. If there exists a divine creator, why should he allow me no more than a primitive propensity for speculating about what could lie beyond this life? Simple. If I now knew with detailed certainty that great and better things lay beyond my death, I would have little or no motive for continuing the painful struggle of this present life. On the contrary, I would have every reason to end my life immediately in order to arrive at that better state of being. I would thereby fail to learn necessary lessons that this life has been designed to teach me. I would fail to evolve, as a conscious being, to the degree necessary to take on that better state of being. As a human being, I see consciousness as my most precious possession. It enables me to deliberately stand back and observe what is going on in my mind. It also bestows upon me the faculty of volition. This gives me the power to override the dictates of my mind's resident instincts and direct it to act according to my considered will. Such intervention, if sustained, will lead to the positive evolution of my personal character. I can use it to determine what I will become. Consciousness also gives me the power of imagination. With this, I explore beyond the reality of experience to create new ideas, which give me the potential to create new realities. My human conscience empowers - and thereby qualifies me unconditionally - to analyse, question and criticize what I observe, experience and suffer from the world outside, including the socio-economic system within which I am constrained live. I do not need a university degree. I do not need to be a member of some excl­usive academic authority. I do not need to hold government office. My necessary and sufficient qualification to express a valid opinion about the state of humanity is that I observe, think and heed my conscience. My opinion is unavoidably based on fallible input. But then equally, so is everybody else's, whoever they may be.